La Boqueria Sustainable fruit carrier design makes carrying sliced fruit a cinch, all the while staying true to its commitment for eco-friendly, recycled materials. Carrying sliced fruit from supermarkets is never easy. The juices can stain, leak through traditional paper bags, and transfer their smell on to other products. Which is why, despite commitment to sustainable packages and paper bags, sellers end up using plastic for these. Not any more. 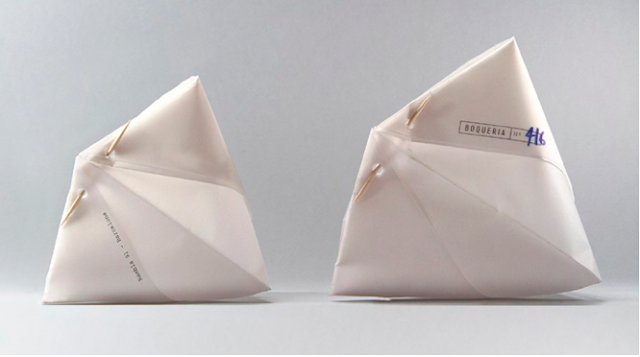 Designers Laia Truque, Paula Sánchez, & Miriam Vilaplana created this carrier as part of their student project at ELISAVA, Barcelona’s premium art and design school. They collaborated with photographer Jose Lopez for high-resolution lifestyle images which immediately grab your attention. Clear imagery also explains how best to make the package, customize and brand it. The material used is a series of folded grease-resistant and 100% biodegradable paper. The package is manually assembled and closed by a toothpick, without using any chemical or adhesive, allowing the consumer to take away fruit in a simple and clean way. The product was pilot launched for little groceries and sliced fruit out-takes of the immensely popular La Boqueria, Sant Josep Market, Barcelona. A simple branding slot in the back side of the package can be stamped using sustainable, natural ink to customize the product category and type. Clean, simple, effective!